This book should finally lay to rest any complaints that Brian is too often vague and evasive in stating what exactly he does believe about the gospel. In this book he is crystal clear. Bottom line: it’s about the kingdom of God. Of course, that’s not to say that Brian purports to answer every question or spell out a detailed systematic theology. Instead, rather true to form, he paints us a picture with broad strokes, giving us a new way to look at what Jesus and his gospel were all about. And he does it with a remarkable clarity and simplicity. Once Brian raised this issue I realized that I too had often been puzzled by this in the Bible. If knowledge of the truth is so very important, then why couldn’t Jesus have just spoken more clearly and told us everything we needed to know. Why did he speak in parables rather than in doctrinal statements? Why does the Bible contain letters and poems and stories rather than systematic theology? He spends the rest of the book describing this revolution and this new world. The book itself is divided into three main sections. The first, “Excavation: Digging Beneath the Surface to Uncover Jesus’s Message”, dives into the historical and especially the first century Jewish context of Jesus’ message. Of course, to me it seems obvious that if we are to really understand what Jesus is all about we must first understand him through the eyes and ears of his original audience. What astounds me is that there are still some Christians who see this approach as a threat to an “evangelical” understanding of scripture. But if we truly respect the Bible and desire to know what it’s really saying, then wouldn’t we want to look at it first through the lens of its historical and cultural context rather than through the lenses of our systematic theologies? After all, most of our current theologies, whether evangelical or liberal, were developed centuries later in response to very different questions than those that concerned Jesus and his followers. As Brian uncovers this historical context of the message he shows how it has revolutionary political and social implications, both for Jesus’ time and for ours. Not revolutionary in the sense that Jesus was trying to violently overthrow Rome and set up a new Jewish kingdom in its place, but revolutionary in that Jesus was calling people to live according to the values and practices of a new social order, and swear allegiance to a different Lord than Caesar. This is the thrust of the book’s second section, “Engagement: Grappling with the Meaning of Jesus’s Message”, as Brian more fully explains the implications of Christ’s message of a kingdom of sacrificial love, subtle subversion and radical inclusion. The third and final section, “Imagination: Exploring How Jesus’ Secret Message Could Change Everything”, discusses the practical and personal implications by examining how this new understanding of Jesus transforms our understanding of social relationships, spiritual practices, as well as the dynamics of just war versus active peacemaking. But Brian wades into even more controversial subjects when he suggests that this new understanding of the gospel requires us to also rethink our traditional understandings of Heaven, Hell and the End Times as well as who is really “in” and “out” of the kingdom and what that means. Without getting too mired down by trying to explain what Brian says about all these topics, I will say that the picture he paints is a far more satisfying and biblically consistent view than many of the ones that I’ve encountered in my theological journey thus far. Of course, it shouldn’t be assumed that much of what Brian writes is entirely his own creation. This entire book is really a popularization of the work of many respected biblical scholars and historians such as N.T. Wright, Walter Wink, Dallas Willard and C.S. Lewis among others. He is standing on the shoulders of others, but he putting their work in terms that are more accessible to the average lay person, and indeed, even to non-Christians. And it’s a message that needs to be heard. I had already started piecing this “secret message” together myself through reading some of the same scholars that have influenced this book, but once again Brian succeeds in putting what I was already thinking into words far clearer and more compelling than anything I could have come up with myself. And this understanding of Jesus’ message certainly will change everything for those who embrace it. Many of the perplexing absurdities and dilemmas of evangelical theology simply disappear when seen through this lens; while at the same time one is still challenged by Jesus’ message to reorient one’s whole life according to this new kingdom lifestyle. At least, I know I was. You should all go buy the book and read it as soon as possible. This is a message that needs to be heard. Not Brian’s message, but Jesus’ message - Jesus true message, stripped of centuries of theological accumulations. This is more than just a new view of the gospel (i.e. new “theology”, new abstract ideas). It’s an invitation to a new kind of life. Jesus secret message is an invitation to live in the Way of the Kingdom. This is the message that we have been committed to teaching and following at our new church plant, Via Christus (the Way of Christ), and it’s a message that I hope all Christians would soon discover, because it’s what we, and the whole world, need to see lived out. So buy the book, read it, then come join us at up/rooted over the summer months as we discuss it. 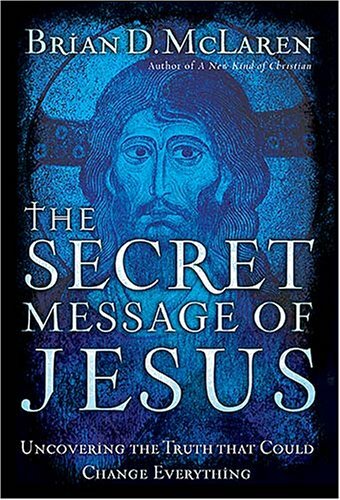 You can order The Secret Message of Jesus here. I'm curious: what would you specifically include in "the perplexing absurdities and dilemmas of evangelical theology?" Theologian David Wenham's excellent, accessible commentary on the Parables (The Parables of Jesus, IVP, 1989)uses the metaphor of revolution as the way to help us "get" the subversive nature of the kingdom. Perhaps the subversive nature of the Kingdom that some see as "secretive" is merely 2,000 years worth of distance from the Oriental and oral culture Jesus spoke of and into with His parables. I suggest Kenneth E. Bailey's two books "Poet and Peasant" and "Through Peasant Eyes". Bailey takes Christ's words quite literally from Matthew 11:25, "I praise you, Father, Lord of heaven and earth, because you have hidden these things from the wise and learned, and revealed them to little children." Christ's parables were clear and concise explanations of life in His Kingdom. As always, His message was so simple wise men feel the need to confound it with "wisdom". His stories, such as the Parable of the Barren Fig Tree become clearer still when you take the time to look at a fig tree. Fig tree's are the only trees in the world that produce fruit before they leaf. Jesus knew the people He was talking to would know this, it was no radical secret. Of course you know if a Fig tree is bearing fruit, leafs or not, the fruit is there. Amazing to think that to the peasants 2,000 years ago Jesus told such simple stories. "I'm curious: what would you specifically include in "the perplexing absurdities and dilemmas of evangelical theology?" Well... for instance, the conflict between the evangelical version of what gets you "in" (to heaven or into the kingdom), i.e. intellectual assent to certain propositional belief statements, and what Jesus said in places like Matthew 7:21-23 or 25:31-46. Oh. Well, depending on how you define “evangelical theology,” I suppose you have a point. The problem is that evangelical theology comes in several flavors. The one you describe sounds a lot like Zane Hodges à la mode, which I believe has been defended by Charles Ryrie. It defines saving faith as consisting in mere intellectual assent. Of course, this thesis was more commonly known as Sandemanianism until the 20th century, when the vast majority of evangelicals developed amnesia with respect to historical theology. It was popularized by Robert Sandeman (1718-1771), who based his views on those of his father-in-law, John Glas (1695-1773), a minister of the Church of Scotland. So it began as a Presbyterian heresy, although it is now common in many evangelical churches. You can find a fairly good introduction to it here. John MacArthur and others have come down pretty hard on Hodges’ revival of this error. But thanks for responding. Thanks for the details on the history of that particular view. I just know it as the predominant view of the evangelical circles I was raised and/or worked in (e.g. the Baptist General Conference, Wheaton College, Christianity Today, and the pop-evangelical subculture of Christian music, youth conferences, devotional books, Christian Radio, etc.) So that's what I react to. In "Waking the Dead", John Eldredge suggests Jesus used story to speak to the hearts of His hearers (vs. their intellects or analytical minds). It's another way of saying the same thing, but particularly poignant with the use of that word "heart". I am a business person and former academic; however, I find sympathic ears on your blog and with McLaren's new book dealing with the "kingdom of God." Therefore, I would be interested in your views regarding Christ final conversation with His disciples in chapters 12-17 of the Book of John. see www.spiritual-benchmarks.com and the John pdf file. I think of this as an executive summary of what Christ and the Father were all about. If one then combines these chapters with God's "Original Commission" to mankind (them) to "...multiple, fill, subdue and rule..," then I know as a lay person that my work is holy and that a primary vehicle for carrying out God "Original" as well as the "Great" commission is "all work." I see Brian's secret as more of a "neglected truth" at least among evangelicals if not other denominations. Christ in John 12-17 does not speak in parables but rather speaks clearing about power and authority and it is reflected in Christ's four statements on prayer. These are mind boggling statements, e.g., "If,...then 'whatever you wish." •Discipling individuals: transforming attitudes and behavior. •Discipling institutions: re-purposing values, practices and policies. •Discipling nations: creating new institutions with appropriate values, practices, policies and structures when necessary. I would appreciate reactions that bear on my work with "young professionals" who think that this perspective just imposes more responsibility rather than understanding that is is missional and along with it comes empowerment (power and authority). The secrets of Jesus are open sercrets! Mark 4:34, "He did not say anything to them without using a parable. But when he was alone with his own disciples, he explained everything." This being alone with his disciples is the act of discipling and are led to take part in it as well both as diciples and diciplers. For instance, Matthew 5:19, "whoever practices and teaches these commands will be called great in the kingdom of heaven." Just like in Jesus' day the parables are spoken to us, in the text of the bible, and Jesus is still alone with us making it all very clear. For, John 14:26 says "But the Counselor, the Holy Spirit, whom the Father will send in my name, will teach you all things and will remind you of everything I have said to you." This is true power and authority. Yes, all of Jesus' secrets are open and it is only human minds and rules that clouds them.